← NaNoWriMo is a bit closer . . .
Yesterday’s post touched on the subject of writing longhand. One of the persons who reads my blog e-mailed me regarding my speculation that typing things out “keeps” up with the speed of thought better than writing longhand. She tended to agree, and also mentioned that her handwriting reading ability had declined, something I had not considered, but seems evident in hindsight. Pretty much everything most many people read these days is printed in type designed for optimal legibility. Handwriting is anything but: she mentioned she had to “get going” on it before she could read my handwriting with speed. Sure, I can read my own handwriting no problem, but I can see where someone who is not used to it needs to “get going” on my handwriting before reading it without effort. Go ahead and read it . . . it’s nice script, relatively easy to read, but you still need to “get going” on it. Do a search on Civil War letters, and read them. These are true longhand letters . . . it takes a bit of effort to recognize the idiosyncrasies of the writer, to learn their style of letters, how they are drawn depending on their placement, etc. None of that is necessary with the text of this post. The type is all standard, regardless of placement or usage. So much so that people don’t actually read all the letters, or even all the words . . . your brain is skimming the words, inferring what they are from how they “look” and a few of the letters. It’s a lot harder to do that when reading someone’s longhand writing. You still do some of that, but you have to pay more attention, and if you’ve not seen the writing before, you have to “learn” how to read it before you can skim through it and have your brain put together the content of a sentence. 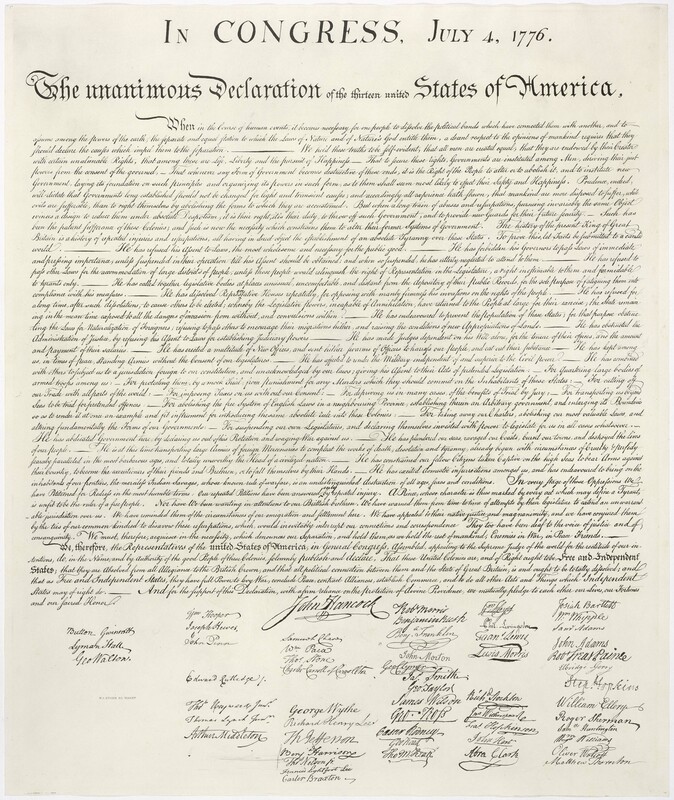 Go to THIS LINK, and read the original draft of the document above, written in Jefferson’s longhand . . . he had nice penmanship, as did many from the time, but you still have to “learn” to read his writing. I presume that is the case with everyone, but once you learn it, you can read it a lot faster than when you first saw it. So, it’s not only handwriting that one needs to keep practice with, but reading handwriting, as well. As for my handwriting . . . just the little writing I’ve done in the last few days has improved my output significantly. I suppose all the writing I did when I was younger left the muscle memory somewhere in there, waiting for it to be awakened. I do plan to keep practicing. When I am not trying to write something specific, I freethought better writing longhand than by typing. My raw typing speed is a tad over 60 words a minute (I don’t touch type, so I’m not that fast). For short messages it’s a tad faster as the sentences are already composed in my head.
. . . yesterday I had a link to my NaNoWriMo Test Sample No 2, written in longhand. I suspected that few people would click on it (two, as of this writing). I suspected it because people are both reluctant to go to a link, and because it was longhand. Well, no fear, here’s the transcription of the piece. Of course, I cleaned it up a bit, something I would have done anyway had it been typed. Late at night, the building silent and nearly empty, footsteps can be heard a long way off. Oddly, these steps kept time with the tiny ‘tic’ from the running ceiling fan above my head.
. . . step/tic . . . step/tic . . . step/tic . . . step/tic . . . tic . . . tic. . . I looked up from the invoice I was working on . . . the steps had stopped in front of my office. I reached over to click the webcam icon on my screen, my other hand reaching for my gun, making sure of its placement. The pop-up window opened; webcams are a good tool for private investigators, and wireless webcams even more so. The lattice of the heating grate opposite my office door came into view, as did a pair of legs, a skirt that ended below the knee, and sensible low-heeled shoes. I absent-mindedly noted the nice calves, no stockings, and tanned. The legs just stood there . . . then half turned to the right. Then they turned to the right again, walked toward the webcam, and folded as the person knelt in front of the grate. A face appeared; a face I knew. “Hello Mike,” the lips slowly mouthed, exaggerating the words . . . she knew there was no microphone. I got up, grabbing the gun as I did so, checking the chambers as I walked to the door. The door opened before I got there. I stopped. “Hello, Diana. Long time no see,” I said, and then I shot her. She caught the bullet, opened her hand to look at it, and then gave me a look and a smile. “Come in, close the door,” I put the gun away as I turned, heading back to my desk. I did not hear her move, but I was suddenly kissing the floor, my arm painfully twisted behind me, her lips next to my ear. “Give me one good reason why I should not kill you,” she whispered. She pulled me up and kissed me. Not many humans loved or even liked our robot overlords, and the feeling was mutual. Except for Diana and me. We were married. This is another idea that is vaguely kicking around in my head. I think this is a tad closer in tone to what I want, but it still doesn’t have that Mike Hammer or Philip Marlowe feel to it . . . wish I still had those books. I suppose I could buy them, even read them before November 1, but really, I would like to come up with my ‘feel’ for the NaNoWriMo novel. As I said, we’ll see. Meanwhile, I have some painting I need to do, more winter prepping for the yard, and prepping for a garage sale we might or might not have. This entry was posted in Fiction, Opinions and Stuff, Writing Stuff and tagged flash fiction, Musings, nanowrimo, Opinion, opinion piece, personal musings, personal opinion, personal views, WPlongform, writing, writing stuff. Bookmark the permalink. Each medium has its own set of codes & conventions and structures information in a way that reflects these codes & conventions. Handwritten text is different from types & printed text. Digital text is different the other forms. Each medium has its own set of strengths & weaknesses. Handwritten text is direct personal encoding of information. There is all sorts of emotional information encoded in handwritten information, the same as brush strokes of a painter convey emotion. Faster forms of media allow thoughts/ideas to disperse quickly. Fast expression responds to emotional energy. Beware of e-mails and tweets sent in emotional haste. Mastering rapid texting/keyboarding skills does not mean mastering complex analytical thought. Fore, example, look at discourse on many blogs and news sites. The rapid staccato of typed text works very effectively with the hard-boiled noir writing. Interestingly that style originated in the age of manual typewriters. “The medium shapes the message.’ Turning. He walked into the digital shadows. Hat brim rested low on his brow, like weary dusk settling on churning smokestacks, he pulled up the pixellated collar of his trench coat. Another post echoing in the twilight of phantom steps, another cup of black coffee emptied. As someone who writes without a map, the thought process and mood seem to direct the stories I write. What I found is that in the days before PCs, typing was distracting and a choir, but handwriting was also not conducive to getting stories down on paper. Handwriting was, and still is, fine for putting down ideas, singular thoughts, and anything that is self-contained. I speak for myself, and I think it is because it is slow and deliberate. For me, and I stress that is strictly for me, the necessarily leisurely transfer of story from thought to paper does not work well, as I will literally lose what I was thinking of as I wait for the handwriting to catch up with the story in my head . . . often because I am already well ahead of what I still trying to write. I’ve heard interviews with writers who specifically write first drafts and ideas longhand because it “slows them down” . . . I don’t get that; I can’t even imagine how to “slow down” the processing of the story in my head since it is not a planned thing, but rather tied to the act of transcription. I have the same disconnect as when someone tells me I have to want to believe in this or that god, and once I do that, all will fall into place. I can’t see how one “make” their thoughts ‘do’ anything. To wit, the numbers of stories I wrote prior to the PC and word processing era are exactly zero (despite having a lot more time). The first story came into being because of the facility of writing and editing on a computer. I keep repeating that’s for me . . . I’m sure experiences differ widely. It remains to be seen if, in fact, what I consider my normal writing style will lend itself and be helpful for noir writing. The image that comes to mind and is popularly shown (even in comics such as Calvin & Hobbes), of the hat, the cigarette, and the typewriter seems different from my experience on the keyboard of a PC. Yes, the process of composition can be facilitated by different media for different individuals. It is all about neurological pathways. For those who have very effectively mastered medium – keyboard or typewriter – will find that the ease of expression flows more smoothly. The other advantage of digital composition is that editing and manipulating of text is much easier. It opened up the doors to many English students when I was teaching – the problem was that less time was given to keyboarding skills in early grades. There is less advantage to ease of expression if you do not have fast enough fingers. What I and other teachers were seeing , was a group now caught in between, they had neither handwriting or keyboarding proficiency. I write things down when I want to remember them, research shows there is something about writing things down by hand that helps the brain to remember more effectively. I found your hand writing quite hard to read. It is elegant but there is not much space between the letters. Except for the printing, which I liked. I make a lot of notes as well, but sometimes they have the opposite effect. I write something down, and then, having transferred the responsibility for remembering to a piece of paper, I promptly get it out of my mind. Of course, I remember when I find the paper, sometimes days or weeks later. I’ve forced myself to utilize the phone more . . . I write something down, and then set a recurring alarm. Harder to forget that way (that also works with the google calendar). As for reading my handwriting, good think I don’t write these posts longhand . . . to be fair, almost all my notes to myself tend to be printed. I’m faster at them, and easier to read at a glance. Thanks for your comments. Moving away from learning cursive writing is a troubling trend. My Dad’s penmanship was flawless. He and my Mom had me practice the Palmer Penmanship Method nightly. While it is easier for me to read typewritten work, it’s a shame that so many students no longer know how to write – or read – handwritten (cursive) works. Yes, they would miss out on the contents of the Declaration of Independence and other works that were handwritten. I had to look up the Palmer Penmanship Method, never having heard of it (I cane to the US in 1966, and don’t recall schools teaching penmanship). As for reading cursive, I see it part of a larger problem with reading, specifically, few people read anything that requires effort, be it in cursive or not. Of course, cursive adds to the difficulty, but I think we have a few generations (including adults) that are self-trained in the art of minimal communication. It works well when arranging a coffee meeting, but not so well when discussing important issues . . . not that you’d know it by reading on-line discussions. You bring up another interesting point . . . I sometimes get into discussions with people regarding what this or that founding father said and stood for . . . people usually quote something that was summarized by someone else, and they seem surprised when I suggest they go read actual correspondence from the people in question. They often are not aware of the material in question . . . now I wonder if they would have the wherewithal to actually read the original material (luckily, most of it is transcribed into type, but still). Thanks for reading; I hope you could read my scratching. Thanks for shining a light on the interesting subject of penmanship. Had not thought much why my handwriting has changed but now I understand better, also given the fact that during my years in office environments I often had to take short dictations without the aid of shorthand (which I duly forgot soon after high school). Nice piece about Diana and Mike. Sorry Mike, but I’m more interested in learning about what makes Diana tic. That story will have to wait . . .